100% of royalties will be donated to fund scholarships to vocational schools for kids from the slums of New Delhi. SEATTLE, WA (MAY 20, 2010) — Bestselling author Rita Golden Gelman launches Female Nomad and Friends: Tales of Breaking Free and Breaking Bread Around the World (A Three Rivers Press Original), June 1, 2010, in Seattle. Forty-one authors tell their stories of adventuring around the world; all but two of them are women. 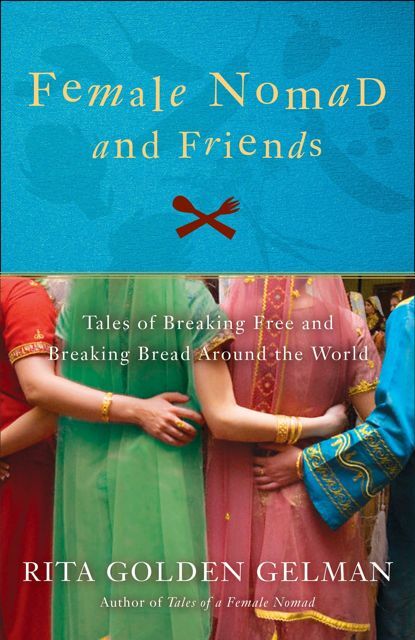 To celebrate the anthology and the special bonding that happens when people share a meal and a book, Rita is hosting a 24-hour global dinner, Connecting through Food, on Friday, June 18th. She hopes you’ll join her by giving a dinner in your home. The Anthology/Cookbook is the sequel to Tales of a Female Nomad: Living at Large in the World (Crown Publishers, 2001) which tells the story of Rita’s selling her possessions and becoming a nomad—living in mud huts, in royal palaces, and on magical islands. She’s been a nomad for 23 years. Her story captivates readers; the book is still going strong. Ignoring a warning from her publisher, Rita included her e-mail address. The last line is: “I can’t wait to hear from you.” She was flooded with e-mails from readers worldwide who offered guest rooms, couches, meals…. and their own stories of connecting around the world. Many of those stories and more of Rita’s adventures are collected in Female Nomad and Friends, which includes 59 amazing tales and more than 30 fabulous international recipes. I’m looking forward to it! So far, I’ve only seen my story and one of Rita’s, so the rest will be fresh to me, too. How do i get a copy Sands?